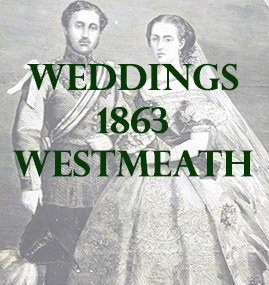 The following list contains marriages that mention places in county Westmeath. At Downpatrick, John D Falloon Esq., son of the Rev J Falloon, Rector of Ballymore, county Westmeath, to Mary, daughter of the late Charles Wm. Ruthven, Esq. At the Metropolitan Church, Marlborough Street, Dublin, Patrick Ryan, Esq., of Leinster Road, Rathmines, to Helena Mary, daughter of the late Joseph Loughnan, Esq., of Mullingar. At St. Peter’s Church, Dublin, George Armstrong Esq., of Leeson Street, in that city to Bessie, widow of Henry O’Connor, Esq., late of Baronstown, county Westmeath.